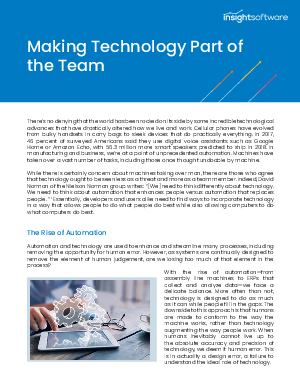 While there is certainly concern about machines taking over man, there are those who agree that technology ought to be seen less as a threat and more as a team member. Indeed, David Norman of the Nielson Norman group writes: “[We] need to think differently about technology. We need to think about automation that enhances people versus automation that replaces people. ” Essentially, developers and users alike need to find ways to incorporate technology in a way that allows people to do what people do best while also allowing computers to do what computers do best.